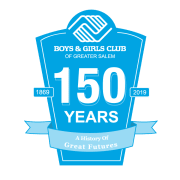 This year, the Boys & Girls Club of Greater Salem is turning 150 years old. We will be coming together in early October for our 150th Celebration Gala event and are looking for creative minds and able bodies to help us in the planning process and the night of the event. There are various ways to be involved - planning and logistics, marketing, communications, set-up, etc.